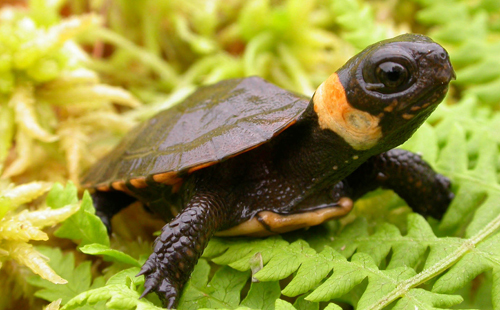 The bog turtle (Glyptemys muhlenbergii) is the smallest turtle found in the United States. The largest bog turtle ever found measured only 4.5 inches. Bog turtles are easily identified by the patches of orange found along the side of their heads. Bog turtles are one of the most rare turtles found in the United States. Laws banning the collection of the turtles for sale have done little to stop the practice with bog turtles being a prized species in many animal black markets. Bog turtle populations are divided into two distinct populations separated by a 250-mile distance. The northern populations found in Connecticut, Massachusetts, New York, Pennsylvania, New Jersey, Delaware, and Maryland are listed as threatened. The southern populations found in Georgia, North Carolina, South Carolina, Tennessee, and Virginia are listed as threatened due to similarity of appearance. Current bog turtle population is unknown, but estimates range from 2,500 to 10,000. Invasive plants such as the purple loosestrife can dry out large areas of suitable habitat. Purple loosestrife grows in large, compact clumps that are impenetrable to the turtle, restricting its movement. Bog turtles are extremely sensitive to the effects of global warming. The turtle’s survival is closely tied to its delicate habitat. Erratic weather patterns resulting from global warming will disrupt the fragile balance key to the turtle’s survival. By altering hydrological cycles, global warming will either dry out or flood the turtle’s habitat. In addition to bog turtles needing a very specific habitat, much of the remaining habitat in the Northeast has been fragmented apart by roads and development. As the changing climate alters the availability of the turtle’s current habitat, they will have very limited ability to migrate to places that could be more suitable. Image credit N.C. Wildlife Resources Commission.